An enormous floating ice shelf in Antarctica that has existed since the last Ice Age 12,000 years ago collapsed this month with staggering speed during one of the warmest summers on record there, scientists say. Scientists stopped short of blaming the collapse on global warming caused by human activity. But they noted that the ice shelf had persisted through previous climate changes well before civilization began altering the environment. "It's a profound event," said geologist Christina Hulbe of Portland State University. "This ice shelf has endured many climate oscillations over many thousands of years. Now it's gone." 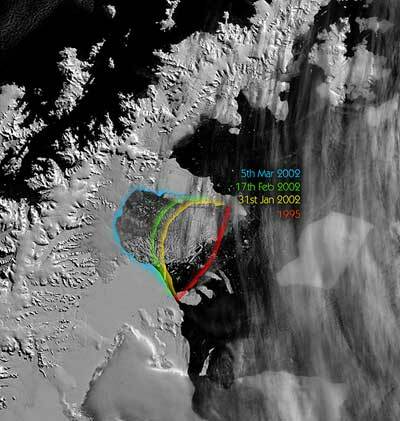 Satellite images show that the piece of the Larsen Ice Shelf collapsed during a five-week period that ended March 7. It splintered into a plume of drifting icebergs. The collapsed area was designated Larsen B, and was 650 feet thick and with a surface area of 1,250 square miles, or about the size of Rhode Island. Larsen B is separate from a new, giant iceberg that satellites are tracking off Antarctica. The iceberg -- designated B-22 -- broke free from the Thwaites Ice Tongue, a peninsula of ice and snow extending into the Amundsen Sea on the other side of the Antarctic Penninsula. B-22 is about 53 miles long and 40 miles wide, according to the National Ice Center operated by the Navy. In contrast, the Larsen ice shelf is on the Antarctic Peninsula and extends about 1,000 miles closer to the tip of South America than the rest of the Antarctic continent. In recent months, with the polar summer just beginning, temperatures were already creeping above freezing in the peninsula region. Scientists said there has also been a 50-year warming trend in the peninsula, which is considered a sensitive, early indicator of global climate change. "We're seeing a very rapid and profound response by the ice sheet to a warming that's been around for just a few decades," said Ted Scambos of the National Snow and Ice Data Center at the University of Colorado. Scambos was one of three U.S. researchers monitoring the Larsen Ice Sheet by satellite. "We can use this as sort of a guide for what's going to happen if the rest of the Antarctic should begin to warm because of climate change," he said. The Larsen Ice Shelf has been under careful observation since 1995, when its northernmost sector, known as Larsen A, collapsed in a similarly dramatic event. The entire Larsen Ice Shelf now is about 40 percent of its original size. "We knew what was left would collapse eventually, but the speed of it is staggering," said David Vaughan, a glaciologist at the British Antarctic Survey. "Hard to believe that 500 million billion tons of ice sheet has disintegrated in less than a month." Previous measurements showed the Antarctic Peninsula has warmed an average of more than 4 degrees Fahrenheit during the past half-century, a rate that is as much as five times faster than the global average. But the overall climate picture in Antarctica is anything but consistent. In fact, glaciers elsewhere on the continent are both thickening and thinning as temperatures show conflicting climate trends. In 1995, when Larsen A broke off, the summer melt had persisted for 80 days, about 20 days longer than average. As for Larsen B, satellite images show that virtual ponds of melted water were forming atop the ice in recent months. Later images showed the water was seeping into the ice sheet's interior, accelerating its demise. The next portion of the ice shelf is known as Larsen C. It is losing stability and could suffer the same fate in the coming years if the warming trend continues, researchers said. And even larger ice shelves elsewhere on the continent's coastline may be just a few summertime degrees away from the same fate. "Other ice shelves are closer to the breaking point than we previously thought," Scambos said. "Breakups in some other areas, such as the Ross Ice Shelf, could lead to increases in ice flow off the Antarctic and cause sea level to rise."